The French Open Championship took place from August 26-28 in Grenoble. Motoki Noguchi, the 2015 champion, defended his title against a slew of tough opponents, including Dai Junfu, Thomas Debarre, and Tanguy Le Calvé. The tournament was held this year at the Minatec campus in Grenoble. It was a vintage year with 32 participants, a number not seen since 2009, and a large number of dan players. The first day offered few surprises, with the top eight players (5-dan and above) alone ending unbeaten, thus promising a interesting fight for the second day. The first big upset was scored by Tanguy Le Calvé, who beat Motoki Noguchi in the fourth round after a fierce game. 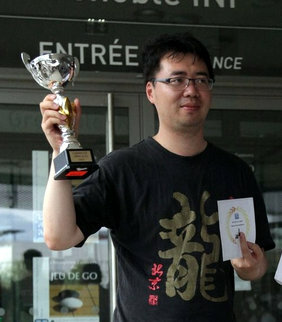 In the fifth round the game between the only two undefeated players, Dai Junfu and Tanguy Le Calvé, took place. Despite some good resistance, Tanguy could not avoid defeat, and it was only Dai who ended the second day unbeaten. Of course the championship was not yet finished, and Dai (right) had more work to do on the third day, beating Motoki Noguchi and Rémi Campagnie, before becoming the 2016 French Open Champion. At the same time, Tanguy confirmed his good form by beating Thomas Debarre by half a point. So in the end Tanguy took second place, ahead of his two unhappy opponents Thomas Debarre and Motoki Noguchi. After taking into withdrawals, the eight players qualified for the French Amateur Championship are Antoine Fenech, Louis Dumont, Dai Junfu, Jérôme Salignon, Baptiste Noir, Jean-Loup Naddef, Denis Karadaban and Tanguy Le Calvé. Thanks to everyone who helped organize the event. All the games which were broadcast on the server OGS (this was a first for us, and a success – there were more than 400 spectators for the game of Dai against Thomas) can be found here, you can also find photos here.